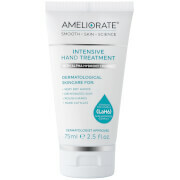 3 Steps to Smooth Skin smooths away bumps and softens and moisturises rough, dry skin caused by Keratosis Pilaris. Our simple, proven formula, Exfoliate + Cleanse + Transform, is designed so each step enhances the next, smoothing bumps and leaving your skin softer, renewed and moisturised for 24 hours. Pack includes 50ml Smoothing Body Exfoliant, 60ml Nourishing Body Wash and 50ml Transforming Body Lotion. 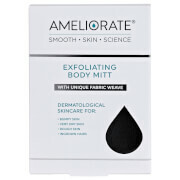 Clinically proven and dermatologist tested, AMELIORATE makes Keratosis Pilaris look and feel better, deeply hydrates very dry skin and leaves normal skin amazingly soft and smooth. Exfoliate + Cleanse + Transform 1. EXFOLIATE with gentle Bamboo granules, Alpha Hydroxy Therapy and LaH6 Skin Hydration Complex. 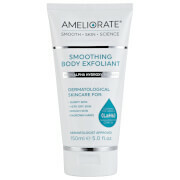 Our Smoothing Body Exfoliant moisturises and removes dead skin cells to prepare skin for step 2. We recommend you use it on dry skin and leave it on a minute or two before you shower or bath. 2. CLEANSE with our Omega Oil rich, ph-balanced, soap-free Nourishing Body Wash which protects the moisture received by step 1 and adds a second hit of hydration with its own LaH6. 3. TRANSFORM your skin with our Transforming Body Lotion! Optimum levels of Alpha Hydroxy Therapy gently exfoliate and moisturise while a 3rd helping of LaH6 leaves your skin beautifully hydrated for 24 hours. DERMATOLOGIST APPROVED Results: Clinically proven to significantly increase moisture levels in the skin for 24 hours 92% agreed the system left their skin feeling softer after using it for 3 days 84% said their skin felt smoother after 7 days 88% said the system left their skin hydrated after 7 days 88% said the system left their skin feeling conditioned after 7 days Independent consumer research tested on 50 people with very dry, dehydrated, rough or bumpy skin.